Education is becoming a major issue as the General election enters its final period. In Scotland, after six days of national strike action, lecturers in colleges have won a major victory in their fight for fair and equal pay and harmonised terms and conditions. Our first piece this week is a report on the win by a Scottish NSSN supporter. The second is a press release issued on May 28th by the NUT, ATL and GMB unions on the manifesto promises on school funding by the main parties. The dispute was won as an escalation of the action was due to take place. 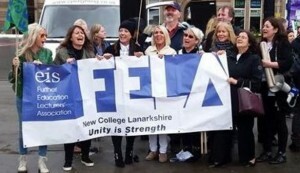 The EIS FELA union refused to call off their action as demanded by the SNP’s education minister, John Swinney, who in a statement to parliament attacked the union and its members and claimed their action was harming students. The SNP have shown yet again their hostility to workers taking strike action, as was the case in last years RMT dispute with ScotRail. A 96% vote for strike action, mass lobbies of parliament and well-attended picket lines, as well as support from students, were an illustration of the determination of the lecturers to fight for their case. They demanded that the management “Honour The Deal” that was agreed after last years strike action which resulted in pay equalisation and increases and nationally agreed terms and conditions. Management had reneged on the agreement and this led to the new round of strike action. Larry Flanagan, general secretary of the EIS union, said: “We have reached a position where Colleges Scotland have agreed to Honour the Deal. This is a significant victory for our members and it means that the employers will move immediately to implement Phase 1 of the pay agreement. The breakthrough came on the back of an agreement on teaching hours for the sector. “Crucially, a no detriment clause has been agreed for all current lecturers; for new starts it will be a maximum of 23 plus 1 (management wanted 24 hours class contact time plus two hours of cover per week) . Where members currently have 24 or 24 plus, they will migrate to the lower levels from next term. A Glasgow college lecturer told us: “Reports in the media, particularly on the BBC focused on lecturers taking strike action over holiday entitlement and when a 9% pay increase has been agreed. This victory should be a first step in a mass fightback against the business model in colleges and education linked with the fights against cuts and privatisation across the public sector. 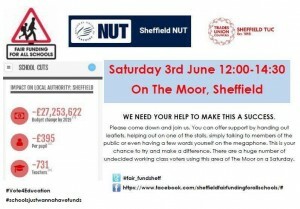 Election Promises On School Funding – – Do The Party Pledges Cut It? Today’s major re-launch of the School Cuts website shows what the manifestos of the main political parties will mean for every individual school in England. Building on recent analyses by the Institute of Fiscal Studies and the Education Policy Institute, the interactive map at http://www.schoolcuts.org.uk makes it possible to see what the party pledges look like at a local level, not just as national statistics. This is a video of the NSSN TUC Congress Rally on 11 September 2016 – Tories Out! Keep Corbyn! Picturehouse Staff BECTU members have been asking for the London Living Wage, recognition of our chosen trade union, adequate sick pay and maternity and paternity pay. Company management continue to refuse negotiations on these issues, despite an approach from the Acas conciliation service. Instead Picturehouse and owners Cineworld have focused their attention on employing expensive lawyers to threaten both us and our union. Cineworld made £93 million profit in 2016, while the CEO’s total pay package was worth over £2.5 million. They can afford to pay their staff properly. Because of the company’s refusal to even meet with us to discuss these matters we have been left with no option but to withdraw our labour. Six cinemas have now voted to strike for these demands. The movement is growing but the company is determined to keep cinemas open during strikes. -less than 20% of maternity pay of in-hosue staff. ← NSSN 342: Support PCS EHRC strike & Crossrail Sparks down tools!